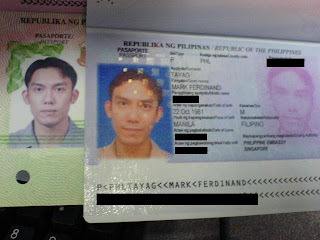 Yesterday morning, I finally went to claim my new passport. If you have read my article about my first visit to the Philippine embassy, we'll here's the follow up. This second visit was different. Instead of taking the bus in Queenstown, I took the bus going to Orchard. When I alighted the bus in Tangs, I walked towards Lucky Plaza and hoped it was the way to the embassy. After a long walk, sight seeing and lots of picture taking, I was on the wrong side of Orchard. When I was walking a long distance and I'm seeing unfamiliar landmarks, I have decided to walk the other direction and asked someone if I'm going the right way now. Luckily, I'm on my right track and I'm seeing familiar places. When I arrived in the Philippine Embassy, I was very thirsty from the long walk and it was very hot. I went straight to Window 5 and handed my receipt to claim my passport. I checked the soda vendo machine and glanced on my coin purse if I can produce $1.10 for the iced lemon tea. Thank God, I was able to sipped a cold drink. Well, to those who are interested to see my new passport, here it is. Just don't laugh at my mug shot. And oh, I'm going to post the pictures from the embassy tomorrow. May you be more charming, richer, healthier and happiest this coming new year!! Wishing you a Happy year 2009 in Singapore! Oh Boy! You look a lot different! Your old image is so fresh and baby face... well, the new one makes you look so much mature. Anyway, congratulations for having a new passport. at least a good walk is a form of exercise di ba.. there's a big difference on your pics.. the other one is more matured and more confident.. I need new passport! too bad not enough money travel out of country.